Our Milky Way galaxy is a spiral galaxy. So are several galaxies in our neighborhood, like Andromeda, Triangulum, and the Pinwheel galaxy (seen above). About 70 percent of the galaxies in our corner of the universe are spiral galaxies. Our general understanding of galaxy formation is that they begin rather irregular in shape as they form, and over time form their spiral shape. We know, for example, that a kind of stellar traffic jam known as matter waves can cause spiral arms to retain their shape even though individual stars move in and out of spiral arms. We also have computer simulations that show how galaxies can evolve from irregular forms to disks, and from disks to spiral galaxies. One of the big questions regarding the formation of spiral galaxies has been whether spiral galaxies are stable in their form, or (barring collisions) do they move away from a spiral shape over time. Most computer simulations indicate that spiral galaxies are stable, but other models are less certain. So it would be good to have some observational data to determine which is correct. In recent years we’ve started getting enough data on galaxies to show that spiral galaxies are stable. For example, a recent paper in the Astrophysical Journal looked at the shapes of galaxies at different redshifts (and therefore different distances). Since light has a finite speed, the more distant a galaxy the older the light from that galaxy is. So by studying galaxies at different distances, you are also studying galaxies of different ages. While determining the shape of different galaxies might seem pretty straight forward, it isn’t. Very few galaxies have a top down view such as the Pinwheel galaxy below. Usually galaxies are tilted at some angle relative to us, so the authors had to take the galaxy images and calculate what their shapes would be if viewed from above. 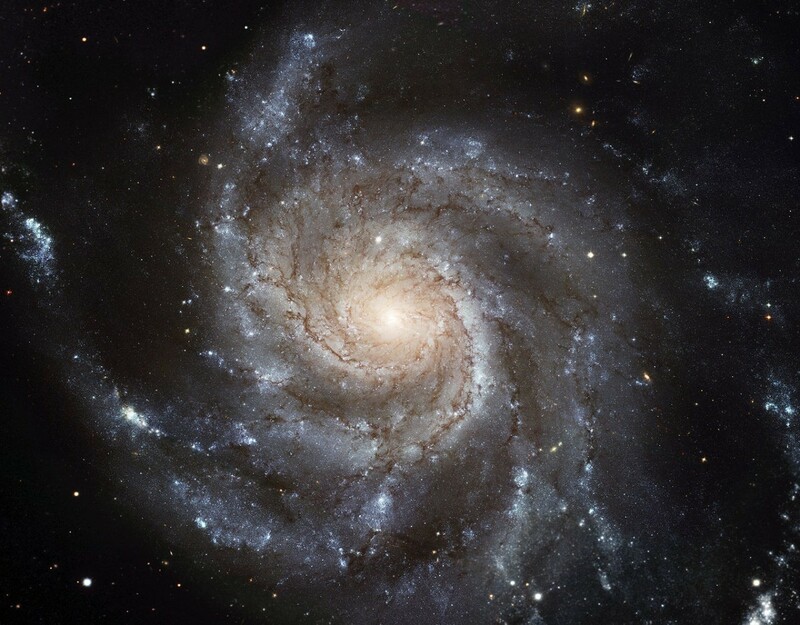 What they found was by a redshift of z = 1.8 (about 10 billion years ago) many galaxies already had a “grand design” shape, meaning they had two main spiral arms. By z = 1.4 (about 9 billion years ago) spiral galaxies begin to be fairly common. Moving ever closer, the fraction of spirals tends to increase. This implies that galaxies can form to clumpy disks, then becoming spiral galaxies that remain stable over cosmic periods. So our galaxy will be a spiral galaxy for quite some time (at least until Andromeda collides with it in about 4 billion years). Paper: D M Elmegreen and B G Elmegreen. The Onset of Spiral Structure in the Universe. Astrophysical Journal 781 11. (2014).